This entry was posted in Practice, Tactical Urbanism and tagged Boston Society of Architects, Event, Public Space, Tactical Urbanism on March 18, 2013 by Russell. My ongoing study of how best to design the human habitat has been consumed by the research of Jan Gehl. I am pleased that the CNU will be hosting him for a keynote lecture at CNU20. If you have not picked up a copy of his latest book, Cities for People , I highly recommend you give it a read. In the film above, Mr. Gehl mentions the importance of Copenhagen incremental approach to the city’s public space improvements. Planners should find it particularly important to note that a master plan would have never been able to get the city to where it is today, and that it was the slow build up of small projects that allowed a greater vision to be created. Perhaps this is the best approach to 21st century city building? Lighter, quicker, cheaper, and, overtime, better. The emerging Tactical Urbanism discussion can certainly learn from Copenhagen’s story. This entry was posted in Public Space, Tactical Urbanism, Urbanism and tagged CNU20, Film, Jan Gehl, Public Space, Tactical Urbanism on October 20, 2011 by Russell. Providence’s Our Town grant will support the Creative Capital Hub project. The project will use arts programming and new urban design plans to transform Greater Kennedy Plaza from a bus terminal with disconnected parks to a grand plaza and central gathering place for the city’s residents, tourists, and workers. Project activities include developing a master urban design plan to guide capital improvements and programming of artistic performances and festivals at the plaza. The project activities will offer an improved public transit experience for the 71,000 individuals that utilize the Greater Kennedy Plaza daily. Not too long ago I wrote about the long term vision plan that I helped develop for Kennedy Plaza, and thanks to the support of the NEA planning and urban design for phase one work will be able to move forward. A big thanks needs to go out to Buff Chace, Lynn McCormick, Cliff Wood and the entire grant writing team. I also need to thank Fred and Ethan Kent for encouraging us to be zealous nuts when it comes to transforming a public square. I am glad to see that a division of our federal government is seeing how investing in the creation of a high quality public realm can effect economic development and livability. Life & Urbanism has been neglected the last few months due to a host of new projects. News on those efforts will be posted soon. In the meantime, I hope you enjoy your weekend by visiting one of your city’s great public squares. This entry was posted in Public Space and tagged Kennedy Plaza, NEA, Our Town Grant, Placemaking, Providence, Public Space, Urban Design on August 5, 2011 by Russell. Cities often overlook their forgotten public squares and parks as key economic development tools. Providence is slowly rediscovering this fact. I have had the pleasure of illustrating the redevelopment vision for Kennedy Plaza. Currently, the square is mostly know as a bus transfer center. However, it is the planning groups aim that one day this space will house New England’s largest, outdoor public market. I am particularly excited about this goal considering my bike ride to and from the office passes right through the square. It has been a pleasure working with all the partners on the creation of this vision. It represents the best ideas the Friends of Kennedy Plaza have today, and they are looking for ways to improve upon it. Visit www.kennedyplaza.org to submit your comments. The film would not have happened without the skills of Ben Chace. Check out his award winning film Wah Do Dem on Hulu. If you would like to know even more about what is in store for the future of Kennedy Plaza click here. This entry was posted in Public Space, Urbanism and tagged Ben Chace, Film, Kennedy Plaza, Placemaking, Portfolio, Providence, Public Space on October 6, 2010 by Russell. It seems American’s are generally starting to reconsider how streets function. If you build places for people then people will come and enjoy them… Pretty logical idea. This entry was posted in Public Space and tagged Cafe, Film, Idea, Incremental Growth, Public Space, San Francisco on August 23, 2010 by Russell. How can a city become more creative? Providence is rebranding itself as the Creative Capital. Sure there are quite a few artists and creative people here already, but shouldn’t this campaign be more then just graphics and websites? Shouldn’t the city be investing in the creation of quality public spaces that attract even more creative people? If we are to truly be the Creative Capital, we need to figure out how we can use our urban landscape better. I presented a few of these ideas at the last Pecha Kucha in Providence. More on making liveable cities later this weekend. 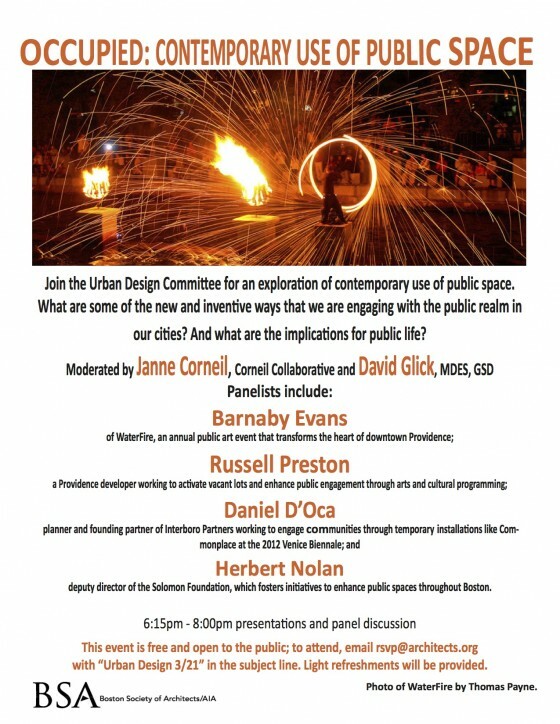 If you are interested in art, sculpture and public art you should check out Gillian Christy’s talk from the same night. This entry was posted in Urbanism and tagged Creative Class, Film, Pecha Kucha, Providence, Public Space, Redevelopment, Russell Preston, Urban Design on September 4, 2009 by Russell. This entry was posted in Urbanism and tagged New York City, Public Space, Shared Space, Streets, Traffic Calming, Transportation, Urban Design, Urbanism on November 24, 2008 by Russell. Why are we not utilizing this thinking in the United States? This entry was posted in Urbanism and tagged Cities, Civic Realm, Design, Public Space, Safety, Share Space, Streets, Traffic Engineering, Urban Design, Urbanism on November 7, 2008 by Russell.